Say hello to Mona’s latest trick, Faro, a Spanish-inspired restaurant that’s home to a world-class immersive artwork. When word broke that Hobart’s enfant terrible David Walsh was developing a brand new wing of Tasmania’s infamous art gallery Mona, bets were hedged about what on Earth it would house. 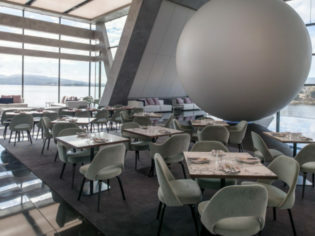 Dubbed Pharos, after Egypt’s historic lighthouse, the plans revealed world-class immersive pieces by American artist James Turrell, and that one – a closed sphere in which the viewer lies down to witness a light display – would be installed in the centre of the new museum wing’s Spanish-inspired bar-restaurant, Faro. Here, diners would snack on kingfish ceviche and Pedro Ximenez-soaked churros while art patrons teeter out of the conspicuous orb (Unseen Seen), grappling with a mind-bending sensory experience. I was intrigued. Locating Faro is an experience in itself. I pause on my labyrinthine journey to ask for directions, but am advised to ‘just keep going’ until I ‘see the light’. I reach a breathtakingly still tunnel of vivid blue light, and slow my pace to take in my surroundings before arriving in the concrete and glass spectacle. At first, the Spanish fare seems a little pedestrian. But while there are touches of Walsh’s signature macabre – pig’s eyeball ice cubes, served floating in black charcoal margaritas, were unfortunately off-menu for my visit – I’m almost ashamed to admit that I feel relieved while scanning through my dining options. At least the food is normal. In fact, the menu is a delight. Executive chef Vince Trim takes full advantage of Tasmania’s bounty of produce to create a seductive selection of share plates. I mentally shortlist more than I can muster. Fresh seafood is served with toasted spices, sherry vinegars and sheep’s milk yoghurt, proteins come crusted with pine nuts, pickled cherries and puffed wild rice, and at least two of the snack plates make good use of Manchego. I settle on gnocco fritto served with chilled Manchego custard; tuna tartare with raw radishes and smoked eggplant; seared scallops accompanied by lightly spiced cauliflower; and roasted brussels sprouts, crisped kale and winter greens with a rich buttermilk dressing, split between two. It’s difficult to fault any element of the dining experience; the service is prompt yet warm, the presentation is alluring yet accessible, the food is mouth-watering without being over-seasoned (especially the raw tuna, a standout doused in cured egg yolk), and unless you’re mainlining $25-per-serve bottled cocktails, it’s surprisingly affordable when compared to prices over in Salamanca Place. For dessert, I opt for the signature Pharos Pearl: an iridescent sphere of white chocolate that encases mandarin and blackcurrant parfait, served on lemon curd, sliced citrus, yuzu gel and almond croutons. It arrives plated in an abalone shell, which seems crudely natural within the flawless interior. And with that, I disappear down the azure rabbit hole, back into the bowels of Hobart’s sublime burrow. Restrained Spanish-inspired cuisine housed in a world-class gallery space, an absolute must-visit when in Hobart. Ideal for dinner dates and indulgent lunches. Ditch the car, take the Mona ferry and try the gallery’s own beers and wines. The architecture (it has to be seen to be believed), the ‘Unholy Water’ bottled cocktails (keep the bottle as a memento), and the menu’s variety (perfect for sharing with friends). The queues at Mona – but they’re always worth the wait. You come highly recommended and will certainly visit when next in Tasmania. REVEALED: Australia’s favourite destinations – in the People’s Choice Awards winners 2018!